Brave, is the best movie from Disney/ Pixar ever since maybe Lion King. Its the first time a major “actor” is someone that looks like me. First off not only is her hair curly but its also red. It might not seem like a big deal for for all curly hair girls out there, there has never been a hero or princess that was “us”. Its sad how long it took but I’m glad there is now “someone” girls can watch and try to be. Not only was it the hair but her attitude was a nice change. She did “boy” “not princess” activities like archery and riding horse. She went hiking and was very adventurous. Last one was like none girly actor was Pocahontas in Disney movies with this theme. But the biggest was that she was to pick a prince but then she didn’t. Even for a 26 year old, it made me feel better. Oh and its in “Scotland” which just made me want to visit even more. As a mutt I have a little bit of Scot in me, so it was fun to see the older time period and what my grand grand x10 father and mother would of been living in. I also loved the whole Viking people/ themes as I love that time period and studying most places they were. Ask any girl who’s been raised on princess films, and she’ll tell you that Merida is different, and very unlike her Disney Princess peers. As far as the narrative goes, what does Merida have in common with Disney Princesses, exactly? The fact that she’s a princess who has utterly fantastic hair. That’s about it. –Rebecca Hains,’Brave’ princess breaks Disney stereotypes. Or does she? So no matter what people say Yes it good and different, or No its the same thing just a bit of a twist, its different. 1- red hair. 2- curly hair. 3- no prince. So yes its different and kids should really see this movie. Its a great film no matter what people say. Its a 10 out of 10. Even if it was just a red hair I would be happy. Curly hair a huge extra wonderful change (yes people do have curly hair) . Add in the change of personal theme and the independent girl was a great things to see. Another point as Americans we forgot is how much our movies impact the girls around the world. It might sometime to get to the “villages” of the world, but it does. All my kids knew of the movies we watched just later. So we might say that anything we like but its being watched around the world. So for the girls around the world we need more then one type of hero to look up to and this is a good start. We need to remember this when we make movies, TV shows, other American things beacuse it will be seen as “America” all around the world and really does effect the people watching it. Is a must see for everyone! It made me so sad to see what is happening! The whole time I was thinking of the time we went swimming in the Amazon to swim with the pink river dolphins, Which was AMAZING! We could hear them and we all fell in love with them and the river. We watched them jump and play from the boat and then got in the water to hear them under, its hard to explain when you know they are talking to each other and maybe could been even smarter then we are. So watching the movie I could see why they did it and I really hope it helps. I hope that now its out in the open people will do something about it. Protest or whatever it takes, its just silly that things like this happen and people don’t stop it! It also made me never want to go to Sea World or places like this. 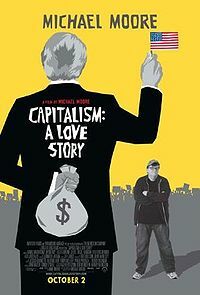 Capitalism: A Love Story is done by Michael Moore, but this might be his best so far. And It makes you really think about Wall Street, who runs the country, ect. I have heard him talk, He came to Luther back in the day and was horrible and the movie has some normal Moore things in it but for the most part its a good movie for both sides.